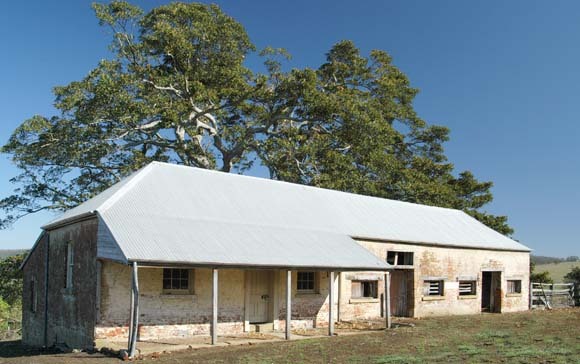 Thunderbolt’s Cottage was built about 1835 and derives its name from the oral tradition which says that Fred Ward lived in this cottage while working at Tocal in the 1850s. Ward went on to become the notorious bushranger Captain Thunderbolt. The cottage was probably built as the overseer's quarters to replace accommodation burnt in a fire at Tocal in 1835. Its design follows the design of some farmhouses in England and Europe, where animals were housed in the same building as the farm family, for warmth and security. There are two separate rooms on the far side, which were probably accommodation for other workers. The cottage gradually fell into disrepair but fortunately was never demolished. (Note: until a few years ago the cottage was thought to have been built by James Webber about 1822 but new research has enabled a more accurate dating).